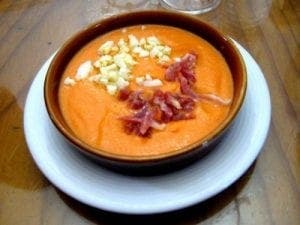 Originating in Cordoba, this traditional dish is essentially a puree of tomato and bread, usually garnished with diced serrano ham and hard-boiled eggs. Reaction: After reading the description of this dish on the menu, I originally expected it to be of a thinner consistency akin to gazpacho but was pleasantly surprised by the thicker, creamier texture. The tomato taste was very prominent and the soup’s coolness refreshing. I especially liked the chopped ham and egg which added an extra pop of flavour and a chewy texture that contrasted nicely with the smooth soup base. 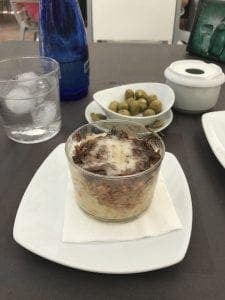 This was definitely one of my favourite Spanish snacks. 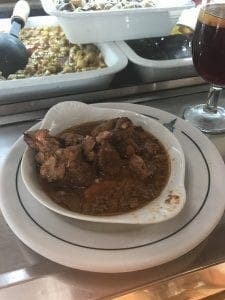 Locally known as rabo del toro, this dish supposedly originated in Cordoba, and with the emphasis placed on bull culture in Spain, it’s not difficult to see why it’s so popular and abundant. Many restaurants opt for a stewed version of the tail, in which the meat must be cooked slowly over a low heat because of its bony and fatty quality. I opted for the meat atop a risotto instead of a more traditional stew (it sounded so good I couldn’t resist). Reaction: I started out by taking some of the meat off of the risotto so that I could taste it without having the rice mask its flavour. The time spent braising the oxtail was well worth it; the meat was so tender it literally melted in the mouth. The flavour was deliciously robust and when I mixed it into the risotto, the rice took on the same strong taste. This was also one of my favourite dishes, and I am looking forward to trying the more traditional style of preparation. Carrilladas de cerdos is a lean cut of meat prepared in a similar way to oxtail – cooked slowly over a low heat for maximum tenderness. I tried them in a tomato, garlic and wine sauce. Reaction: Like the oxtail, these pieces of meat were flavourful and mouth-meltingly tender. Each of the three main ingredients in the sauce were noticeable and complimented the meat nicely. There were also some carrots in the mix which gave the dish a stew-like consistency. After the meat was gone, I enjoyed mopping up the last of the sauce with my bread. 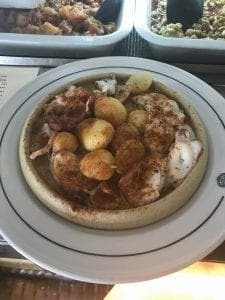 Pulpo Gallego is a dish popular in the northwestern region of Spain, namely Galicia. The dish is often prepared by slicing up the tentacles, and boiling them with an onion. They are then drizzled with olive oil and spiced with a coating of paprika. 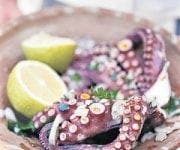 Potatoes are also boiled in the water after the octopus is cooked, and served alongside the tentacles on a wooden platter. Reaction: I love seafood and squid, so I was very surprised that I didn’t like this dish as much as I thought I would. The texture was great; firm without being too rubbery, as calamaris sometimes are, and some of the pieces had their suction cups attached. 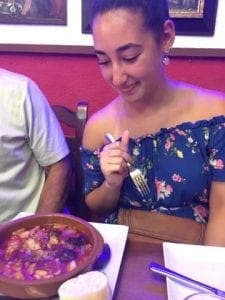 The flavour was a little bland, which can be expected from the style of preparation, but it was also slightly bitter due to the paprika. The taste of the potatoes was indistinguishable from the octopus so it was clear they were cooked in the same water. Overall, the dish was enjoyable but not one of my favourites. There are two English translations for callos – tripe and calluses – neither of which sounds very appetising. 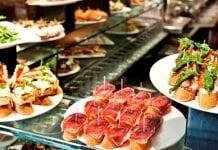 Spaniards from all over, however, will encourage you to look past its unsavoury aspects and give the stewed lining of cow’s stomach a chance. There are variations of the stew, which generally contains garlic, onions and white wine. 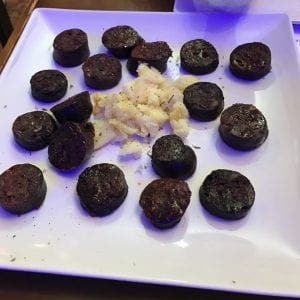 The version I tried also contained blood sausage. Reaction: The waiter made sure I knew what I was actually ordering. “You know this is tripe right?” he asked. When I responded ‘yes’ he promised that although strange in appearance, it was actually very delicious.Unlike the octopus, the taste was fantastic but the texture was not great. Some pieces were soft and gelatinous, others firmer (which I personally preferred, although the softer pieces were not off-putting in the least). I enjoyed the robust flavour and paprika kick and the sauce tasted just as good on bread as it did on the callos. Known as morcilla al horno, this is essentially blood sausage, cut into small pieces, baked with olive oil, spiced and served with potatoes. The sausage is dark in colour, indicative of the pig’s blood it contains. Reaction: The waiter again made sure I knew I was asking for blood sausage, but offered no reassurances as to my likely enjoyment. Of all of the dishes, I was most apprehensive about this one, mainly because the thought of eating blood made my stomach churn a little. The outside was extremely chewy, the inside soft and crumbly. The initial meaty flavour wasn’t bad but there was an aftertaste of a spice I couldn’t figure out and didn’t much like. It was overpowering and gave the sausage a bitter taste that reminded me I was, in fact, eating blood. This was my least favourite dish.